When an airline creates a new route, they plan the most optimal experience. Direct to the destination, with the perfect plane and plenty of frequency. However, when an airline starts to cut routes or enter financial difficulty, sometimes things get a little messy. This is the case with WOW Air, who is now the owner of one of the world’s worst flights. It might even be worse than the Lufthansa Frankfurt to Pune flight. WOW Air, of course, is currently undergoing plenty of stress. They were recently almost bought up by rival Icelandair but were then dropped. 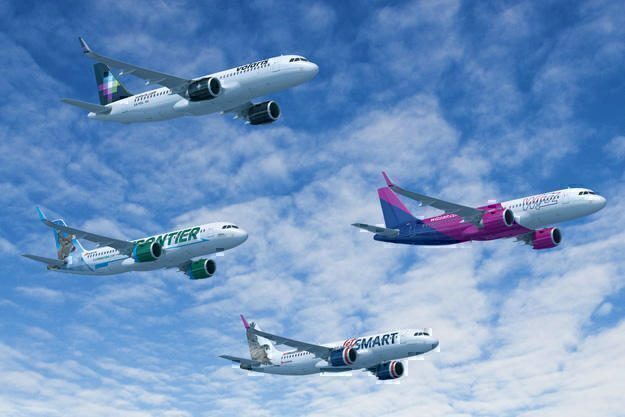 WOW Air is currently being considered by Indigo Partners, owners of Wizz and Frontier. The fleet of Indigo Partner Airlines flying in formation (Computer generated). The route was originally an Airbus A330 flight from Iceland to Los Angeles. It flew four times a week. But WOW Air has been struggling and recently had to return a few of their Airbus A330’s. They now only have one A330 left and they need to use it on their new India route. Thus they have had to use an Airbus A321 for the same route. But clever readers will notice that an A321 has only the range of 3,200 nmi (5,950 km or 3697 miles), but Keflavík International Airport to Los Angeles International is actually 3,212 nmi (6,921 km or 4300 miles) as the crow flies. Thus the humble WOW Air A321 needs to make a fuel stop, and what more central location than Edmonton (Canada). The new route takes 10 hours and 35 minutes of flight time and is awfully cramped. The route is reported to be reduced to a once a week frequency and then shut down between January 28, 2019, and April 2, 2019. We are not sure at this time if it will keep going after april. Why would WOW Air want to do this? Two main theories have been published as to why they would do this. They want to reduce the capacity on the route over the quieter winter period. It’s easier to simply run a smaller plane (and move the capacity elsewhere) than to pause the route entirely. WOW Air simply does not have the aircraft available to run this route, that they can’t get another A330 in and they have resorted to using an A321 just for the time being. According to the WOW Air website, there will be a new A330 operating the route after the winter period. Whether or not WOW Air will be around then is another story. Would you want to fly on this route? KEF-LAX is actually ~3741nm, not 3212nm; The other numbers look correct. I have a KEF-LAX flight after Jan 28th and WOW confirmed to me yesterday that the flight will happen as scheduled, which is not in line with what I read here and on other places that the line will shut down on 28/1/19.